At Dewey Insurance Agency, we can provide insurance coverages for your ATV, Jet Ski or off-road vehicles in Kalkaska and throughout the state of Michigan. If you own an ATV or off-road vehicle, you need to be sure you have the right coverage in case of an accident or loss. While some homeowners insurance policies might cover certain liabilities, in many cases Kalkaska, Michigan residents need an additional ATV policy to give them the complete coverage they need. Depending on the vehicle type, we can help you protect your investment by finding the right coverage suited to your special vehicle. ATVs, off-road vehicles and Jet Skis can be subject to specialized rating rules. 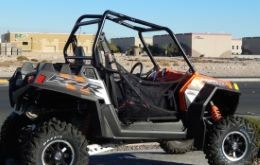 Our insurance professionals have knowledge of insurance carriers' special requirements and can assist you in finding the right ATV, off-road vehicle or personal watercraft coverage at a competitive rate.